Rai Leh (อ่าวไร่เลย์), also commonly known as Railay, is a tourist area located on the Andaman Coast of Thailand, in Krabi Province. Rai Leh is primarily known as a rock climbing hot spot, attracting climbers from all over the world to its superb towering limestone. As Rai Leh is a peninsula surrounded by ocean and mountains, final access can only be by boat. Long-tails depart from Ao Nang (10 minutes, 100 baht/person, minimum 6 people) and Krabi (30 minutes) on demand, making those towns the gateways to Rai Leh. It's also possible to access Rai Leh via regular ferries that run between Ko Lanta, Ko Phi Phi, and Phuket (more frequent in the November-May dry season - times available from local travel agents, or check online ferry schedules). The Krabi, Phuket, Ko Lanta and Ko Phi Phi articles have information on reaching the gateways to Rai Leh from throughout Thailand. From Bangkok there are flights to Krabi and Phuket, direct bus services, and trains to Surat Thani with onward connections by bus. NB: If departing from Ao Nang, be aware that you're expected to walk out several meters into the surf before getting on a boat (depending on the tide). It might be best to change into clothes suitable for getting wet, or at the very least be sure you don't have more luggage than you can carry a few meters into the ocean. It's a 5-10 minute walk between any of these landmarks. The village itself is a pedestrian's dream, as there are no cars, and the uneven bumpy walkways make even bicycles impractical. Phra Nang Cave, also known as Diamond Cave, on the east side of the peninsula, to the north of Rai Leh East, is an interesting place to explore and one of the few strictly sight-seeing destinations at Rai Leh. A nominal entrance fee pays for a short walk along the lit boardwalk through formations that glitter as if they were full of diamonds. Though not breathtakingly large (and thus easily viewed in about fifteen minutes) it is quite beautiful. 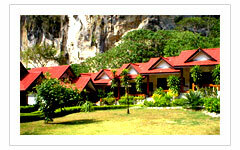 The cave is a common stop for day trips from Phuket and Ao Nang. Lagoon & Viewpoint, walking on the path to Phra Nang Beach there is a sign that points towards an upward path to a viewpoint of Rai Leh and Ton Sai. The climb to the top takes about 20-25 minutes and to the viewpoint another 10 minutes. From the top of the trail, there is another path that leads down towards the jungle for about 20-25 minutes to the lagoon. The path to the lagoon can be difficult and some have carried climbing gear to reach the lagoon. There are ropes along the paths. Rai Leh is perhaps the best winter sport rock climbing area in the world, with over seven hundred bolted routes up limestone faces with breathtaking views over the ocean. If you are an avid rock climber, chances are you already know about this place and the spectacular cliffs are the reason you are here. Climbing is graded on the French scale, most is steep and challenging with only limited possibilities for beginners. Due to the corrosive nature of the seaside location, the steel bolts may be of questionable integrity, bolt failure is not uncommon here, and threads (rope tied through holes in the rock) may be of questionable integrity as well. Overall the rock quality is superb; however, like everywhere else, you will find the occasional loose section including the famed Rai Leh stalactites. Required climbing gear: Rai Leh and around is all sport climbing. Beyond a 60 metre (200 foot) rope, sixteen quickdraws, your harness, shoes and a lot of chalk, you won't need much else. Anything you forget or don't have can be rented at the climbing shops. Guides: Rai Leh and Tonsai have several guide operators with services ranging from introductory rock climbing courses to rent-a-belay partner. Andaman Adventures. 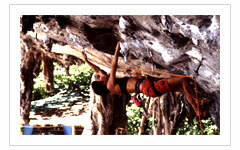 Combined climbing holidays to Railay/Tonsai, Koh Lao Liang, Koh Phi Phi and Koh Yao Noi. 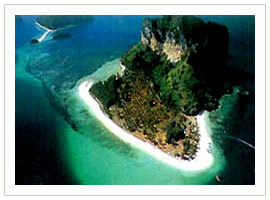 Phra Nang Adventures Exclusive guide to Ko Lao Liang for climbing/diving/camping. King Climbers - on the east side of Rai Leh, next to Ya Ya's accommodation. Hot Rock Climbing School - on the west side of Rai Leh, near the Flametree Bar and Restaurant, and the owner Luang has been around the area for over 15 yrs. Guide books: There are three different guide books published in a variety of languages by the local guide shops, each providing excellent directions and route finding. Most were updated around 2004 or more recently and can be ordered online, directly from the guide shop, or your local climbing store might carry stock. Rock Climbing in Thailand by Elke & Wee. New edition 2007. Thailand: A Climbing Guide published by The Mountaineers and written by Sam Lightner Jr. All the money earned from it is to be donated to the re-bolting cause:. Snorkeling is not a major draw for Rai Leh though it is possible to swim out and see coral and fish a few meters off the sandy beaches. Beware of the ever present longtail boat traffic. Most looking for some snorkeling fun rent a longtail and head for the islands south and west of Rai Leh, such as Poda Island, but even there the snorkeling is only moderate. Some hotels organize snorkeling trips or you may prefer to charter your own boat for the afternoon. A one way trip usually takes less than 25 minutes. Rai Leh itself does not offer many trekking opportunities, as the peninsula is so tiny. The one interesting and undeveloped area is the jungle atop the limestone towers that make up the club-shaped southern end of the peninsula. Along the paved path that runs from Rai Leh East to Phra Nang beach, a so-called "trail" leads up a slippery, rocky embankment to the jungle-covered plateau. A narrow, indistinct trail circles the top of the southern tower, with a left turn offering access to the highest point (accessible via a sheer face and thus navigable only with climbing gear) as well as a fantastic lookout point over the peninsula. A right turn on the path leads downward into a hidden glen, which provides access to the secret lagoon called Sa Phra Nang or Holy Princess Pool. The route from this glen to the lagoon leads down a steep, rocky ravine, and the path is covered with slippery red clay, making it quite treacherous even for the experienced. The technique is not so much climbing as scrambling, and the knotted nylon ropes are often more dangerous than they are helpful. The lagoon itself is breathtakingly beautiful, but try not to step in, as the soft bottomless muck has quite a penchant for trekkers' footwear. Rai Leh has many small general convenience stores with various essentials at reasonable prices, considering shipment costs to what is essentially an island. Though most shoppers (souvenir or otherwise) will be better satisfied in nearby Ao Nang, clothing, souvenirs, beachwear and such are all also available in various small shops in Rai Leh East and Rai Leh West. There are no real grocery vendors, so meals are limited to the restaurants, though some small snack items are available in the convenience stores. Rai Leh has a variety of restaurants to choose from, although none are remarkable (for Thailand at least) in character or quality. In general however, the food is what you would expect for southern Thailand - tasty and inexpensive. Rai Leh West has four restaurants: one for each of the three hotels on the beach, and an independent restaurant named Flametree. 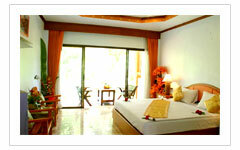 All offer breakfast, lunch, and dinner along the beach with a lovely view of the surroundings. Flametree Restaurant and Bar serves Thai and International food. Amazing curries, American breakfasts, Real Coffee, Fruit salads and shakes, Deli sandwiches and icecream, Picnic lunchboxes, Sunset drinks and Dinner specials. Rai Leh East has more restaurants and the variety is much greater, though none offer the scenery of the west beach (restaurants near Diamond Cave may be an exception where they offer an impressive view of the bay from their position higher up the hill). 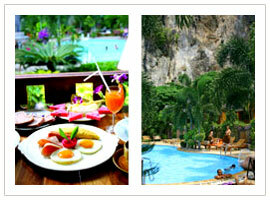 Check out 'the Rock' - Restaurant & Bar - a short walk up from the Diamond Cave. It is an amazing Thai style structure and It offers a spectacular view of the sea, and the rocks from above during daylight hours. During night maybe the only place where you can enjoy your meal without the hustle and bustle the beach front brings. Very well worth a visit. There are several other bars situated on the beach, each attached to one of the hotel restaurants, and all quite pleasant for a relaxing sunset cocktail. Flametree is the only stand-alone bar on Rai Leh West. They layout beach mats on the sand during the evenings which makes for an ideal location to enjoy the sunset. Rai Lay Bay Resort Bar is attached to the restaurant at the Rai Lay Bay Resort and Spa Hotel. The bar is beachfront and is lined with stools and shaded by the nearby palm trees. As it is the largest bar on Rai Leh West, it usually fills up quite quickly prior to sunset. NB: Currently under renovation. Last Bar really is the last bar. At the end of Rai Leh East, it is the closest thing to a dance club Rai Leh has to offer. 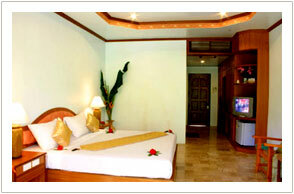 With nightly shows, and plenty of travelers, it is the place to spend the night if you plan on having a few Chang beers. Stone Bar is located near Diamond Cave climbing area, five minute walk up the path from Diamond Cave Bungalows if you are starting at the beach. 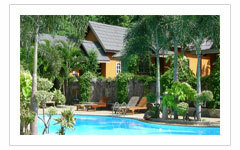 It is a peaceful, relaxed place to spend a few chilled-out hours. The name is indicative of both the rock upon which a drinking platform is perched, and also a tip of the cap to the rasta colors it flies loud and proud. It's well worth a visit and also has a variety of games such as chess, connect four and draughts to while away lazy hours. Rai Leh East offers more in the way of energetic bars with dance music. These bars can be found near the Diamond Cave Bungalows.